On Sept. 16, 2017, CSUN President Dianne F. Harrison (left), other university leaders and hundreds of guests celebrated with Younes (seated) and Soraya Nazarian (right) and their extended family. 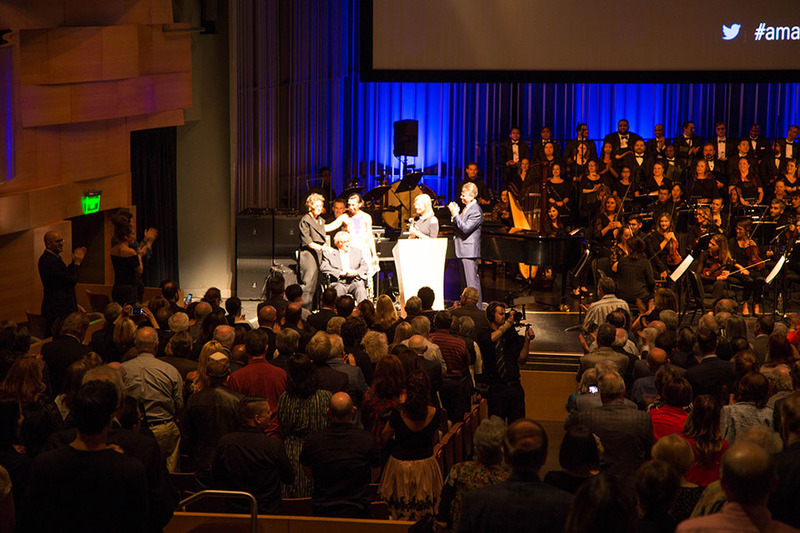 The festivities celebrated the renaming of the university’s performing arts jewel to the Younes and Soraya Nazarian Center for the Performing Arts, in recognition of a gift from the Y&S Nazarian Family Foundation. “The Soraya” is the center’s new, preferred nickname. Photo by David J. Hawkins. CSUN Alumni Association President Cindy Chernow (right) greets Younes Nazarian (seated) as his daughter Sharon looks on, Sept. 16, 2017. 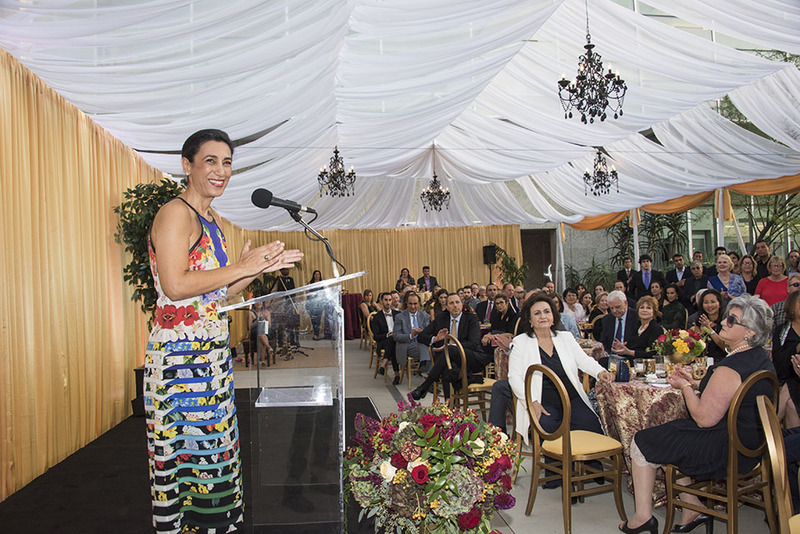 The festivities celebrated the renaming of the university’s performing arts jewel to the Younes and Soraya Nazarian Center for the Performing Arts, in recognition of a gift from the Y&S Nazarian Family Foundation. “The Soraya” is the center’s new, preferred nickname. Photo by Lee Choo. (L-R) California Secretary of State Alex Padilla, CSUN President Dianne F. Harrison and David Nazarian celebrate with David's parents, Younes and Soraya Nazarian, and their extended family, Sept 16, 2017. 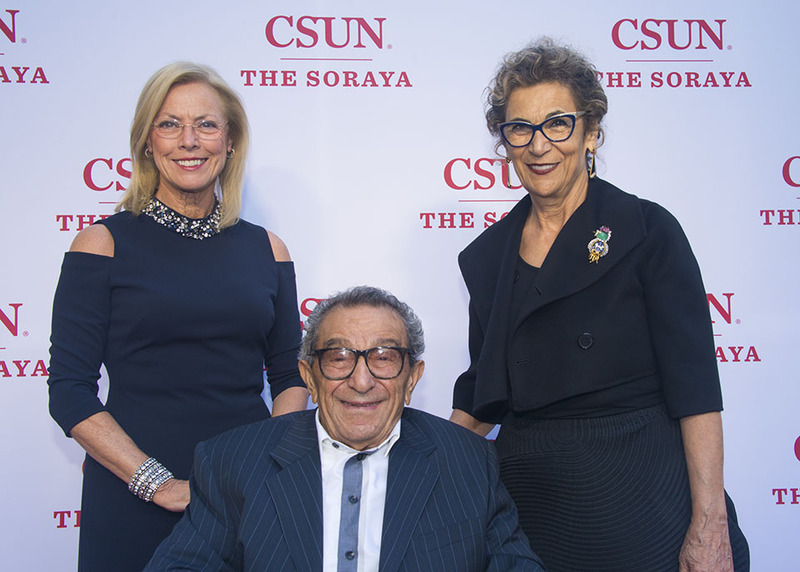 The festivities celebrated the renaming of the university’s performing arts jewel to the Younes and Soraya Nazarian Center for the Performing Arts, in recognition of a gift from the Y&S Nazarian Family Foundation. “The Soraya” is the center’s new, preferred nickname. Photo by Lee Choo. The Nazarians’ daughter, Sharon, president of the Y&S Nazarian Family Foundation, told pre-event reception guests that the foundation’s gift hit close to her family’s heart. On Sept. 16, 2017, CSUN President Dianne F. Harrison, other university leaders and hundreds of guests celebrated with Younes and Soraya Nazarian and their extended family. 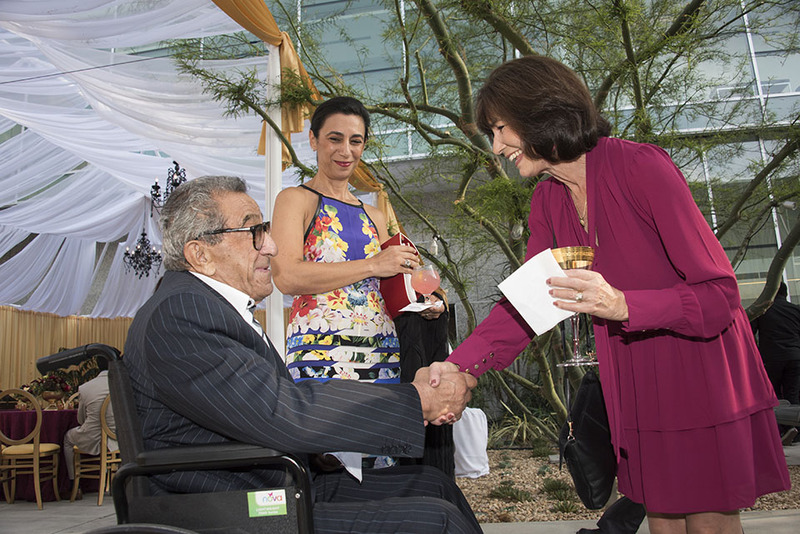 The festivities celebrated the renaming of the university’s performing arts jewel to the Younes and Soraya Nazarian Center for the Performing Arts, in recognition of a gift from the Y&S Nazarian Family Foundation. “The Soraya” is the center’s new, preferred nickname. Photo by Lee Choo. CSUN President Dianne F. Harrison greets guests and recognizes the extended Nazarian family (seated in foreground), on Sept. 16, 2017. The festivities celebrated the renaming of the university’s performing arts jewel to the Younes and Soraya Nazarian Center for the Performing Arts, in recognition of a gift from the Y&S Nazarian Family Foundation. “The Soraya” is the center’s new, preferred nickname. Photo by Lee Choo. On Sept. 16, 2017, CSUN President Dianne F. Harrison (at podium), performing arts center Executive Director Thor Steingraber (standing, right) and hundreds of guests celebrated with Younes and Soraya Nazarian, their daughter Sharon and their extended family. 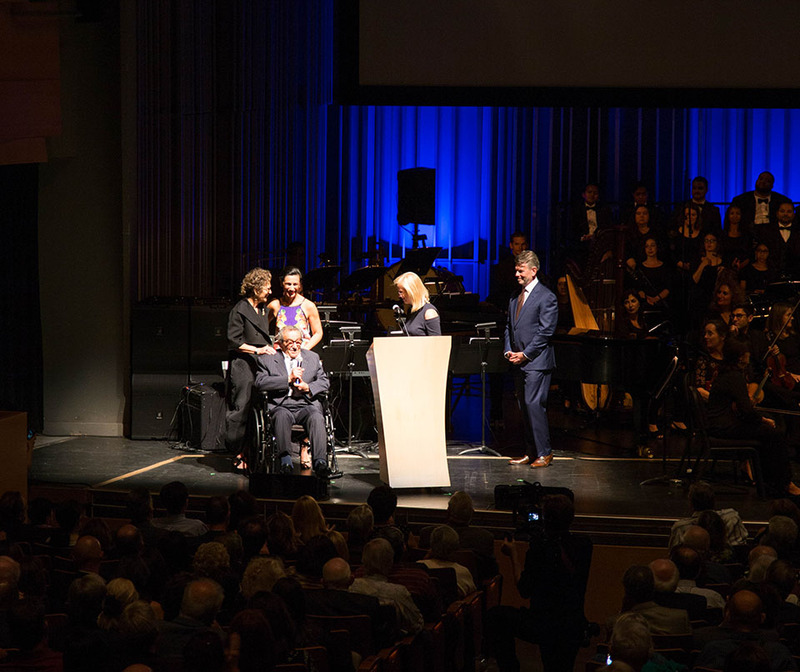 The festivities also celebrated the renaming of the university’s performing arts jewel to the Younes and Soraya Nazarian Center for the Performing Arts, in recognition of a gift from the Y&S Nazarian Family Foundation. “The Soraya” is the center’s new, preferred nickname. Photo by David J. Hawkins. On Sept. 16, 2017, CSUN President Dianne F. Harrison (at podium), performing arts center Executive Director Thor Steingraber (standing, right) and hundreds of guests celebrated with Younes and Soraya Nazarian, their daughter Sharon and their extended family. 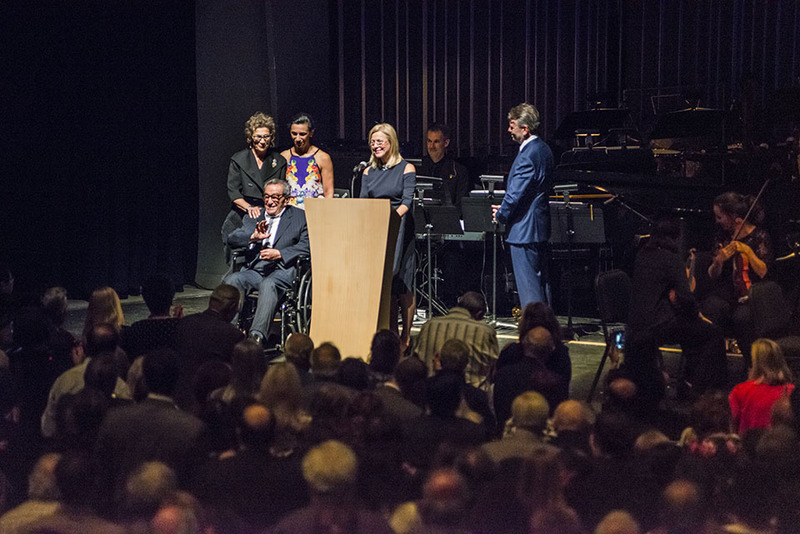 The festivities also celebrated the renaming of the university’s performing arts jewel to the Younes and Soraya Nazarian Center for the Performing Arts, in recognition of a gift from the Y&S Nazarian Family Foundation. “The Soraya” is the center’s new, preferred nickname. Photo by Kendra Kabasele. As Younes, Soraya and Sharon Nazarian greeted CSUN President Dianne F. Harrison on stage just before the performance began, the audience rose to its feet in a raucous standing ovation, Sept. 16, 2017. Photo by Lee Choo. As Younes, Soraya and Sharon Nazarian greeted CSUN President Dianne F. Harrison on stage just before the performance began, the audience rose to its feet in a raucous standing ovation, Sept. 16, 2017. Photo by Kendra Kabasele. Opening Night for the newly renamed "Soraya" kicked off the new season of CSUN’s performing arts center with a thrilling screening of the 1984 Oscar winner "Amadeus," accompanied by the Los Angeles Chamber Orchestra and members of the LA Opera Chorus, under the direction of CSUN alumnus and distinguished conductor Richard Kaufman ’77 (Music, standing at podium). Photo by David J. Hawkins. 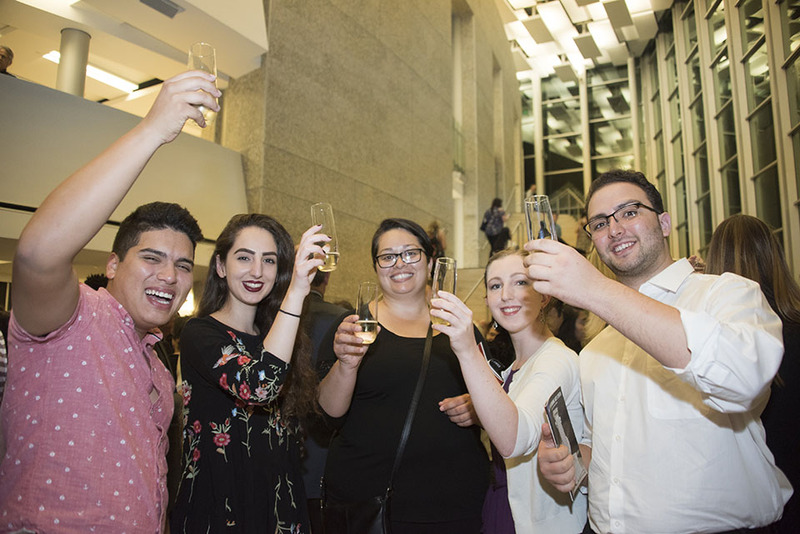 At intermission Sept. 16, 2017, CSUN alumni and students joined university leaders and hundreds of guests in raising glasses of prosecco for a celebratory toast with Younes and Soraya Nazarian and their extended family. 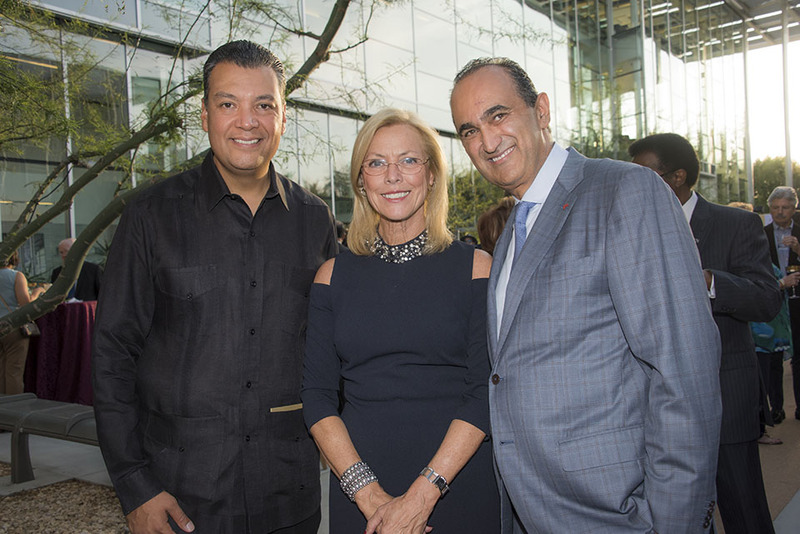 The festivities celebrated the renaming of the university’s performing arts jewel to the Younes and Soraya Nazarian Center for the Performing Arts, in recognition of a $17 million gift from the Y&S Nazarian Family Foundation. “The Soraya” is the center’s new, preferred nickname. Photo by Lee Choo. Cheers! 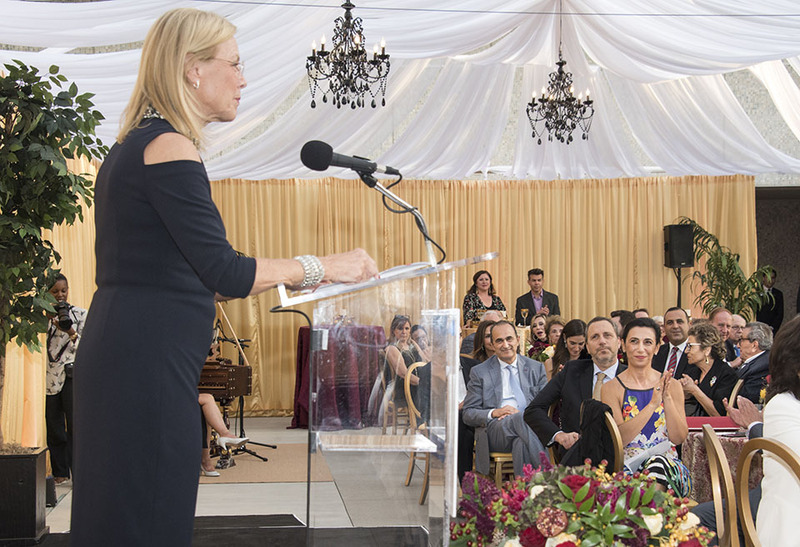 On Sept. 16, California State University, Northridge President Dianne F. Harrison, other university leaders and hundreds of guests raised glasses of prosecco in celebration with Younes and Soraya Nazarian and their extended family. 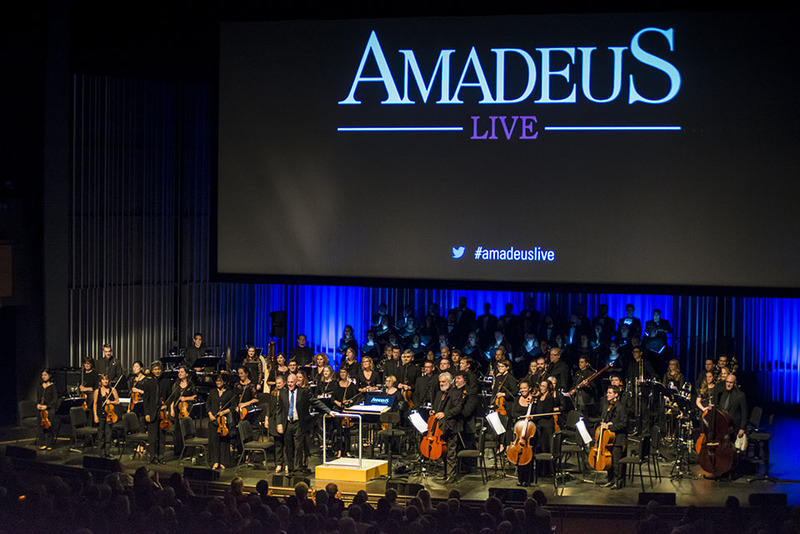 The evening kicked off the new season of CSUN’s performing arts center with a captivating screening of the 1984 Oscar winner Amadeus, accompanied by the Los Angeles Chamber Orchestra and members of the LA Opera Chorus, under the direction of CSUN alumnus and distinguished conductor Richard Kaufman ’77 (Music). The Saturday-night festivities also celebrated the curtain rising on a new era. In July, Harrison announced the renaming of the university’s performing arts jewel to the Younes and Soraya Nazarian Center for the Performing Arts, in recognition of the transformative gift from the Y&S Nazarian Family Foundation. “The Soraya” is the center’s new, preferred nickname. The gift was one of the largest in the history of the California State University and the system’s largest single gift to support the arts. It will support the programming and operations of the award-winning performing arts center. “Words can hardly express how happy I am to welcome you to The Soraya,” Harrison told the audience before the show. “Today is truly transformational for CSUN and for arts in Los Angeles. Please join me in applauding Younes and Soraya’s commitment to making the arts inclusive and accessible to all. The Nazarians’ daughter Sharon, president of the Y&S Nazarian Family Foundation, told the audience that the foundation’s gift also hit close to her family’s heart. “We are honored to have our family and our family name associated with this beautiful institution,” she said. “When we learned about this university, the community it supports, the students it supports and the vibrant cultural mix of this campus — we saw that it is made up of immigrants just like us. We couldn’t imagine a better place to make our investment. We are thrilled to have all of you here tonight as we celebrate the beginning of this beautiful relationship and this beautiful jewel. 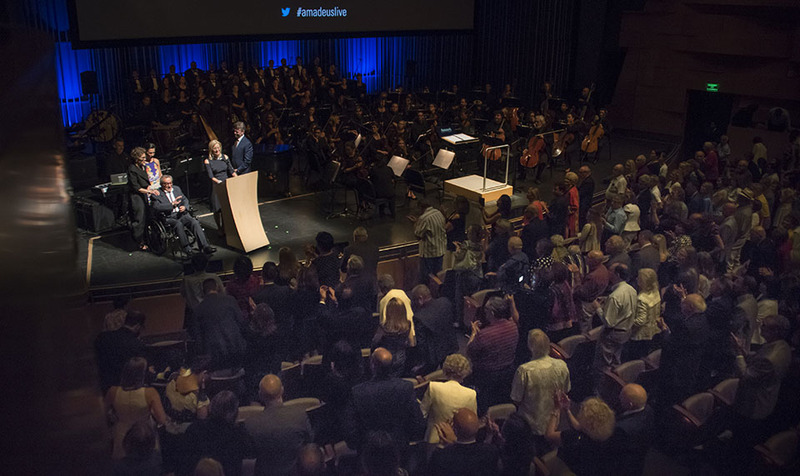 As Younes, Soraya and Sharon Nazarian greeted Harrison on stage just before the performance began, the audience rose to its feet in a rousing standing ovation. The Nazarian family’s support for CSUN started in 2014 when their son, David ’82 (Business Administration), a prominent businessman, philanthropist and CSUN alumnus, made his own gift that was recognized by the naming of CSUN’s business college as the David Nazarian College of Business and Economics. In 2016, his parents donated 50 laptops to deserving business students and also were title sponsors for the 50th-anniversary celebration of the college, an event that capped a two-year, $25-million fundraising drive. Most recently, Soraya Sarah Nazarian, a sculptor who works with Carrara marble, created and donated a majestic original sculpture, Unbound, which was installed at CSUN’s Nazarian College. “The Nazarian family’s character runs deep, such that Younes and Soraya, their children and now their grandchildren, do not rest on their tremendous personal and professional success,” said Vice President for University Advancement and President of the CSUN Foundation Robert Gunsalus. “They not only give with extraordinary generosity — they also are vigorous champions for the causes they support, which furthers what was already a bright future for The Soraya. The Nazarians moved from Iran to the United States in 1979 with their four children, fleeing the religiously targeted violence and demonstrations that led up to the Iranian Revolution of 1979. Younes Nazarian was an early investor and served on the board of directors of San Diego-based Qualcomm, Inc., a leader in wireless telecommunications research and development. While her husband built businesses, Soraya Sarah Nazarian pursued her passion for art, establishing her own studio in LA. Her sculpture work carries themes of motherhood, family, spirituality and Iranian culture. The center’s 2017-18 season, themed Music Knows No Borders, builds on the acclaimed lineups of international artists in the past couple seasons. Steingraber and his colleagues are bringing to Northridge artists from 14 different countries that shine “a bright light on our differences, to affirm how much we have in common,” he said. These include The Sachal Ensemble from Pakistan on Nov. 14, Israeli clarinet virtuoso Anat Cohen on Nov. 30, and ¡La Nueva Cuba! The Next Generation on April 21 with jazz artists Roberto Fonseca, Daymé Arocena and Pedrito Martinez Group. More information about the Younes and Soraya Center for the Performing Arts can be found at www.valleyperformingartscenter.org.